Magglio Ordonez will announce his retirement this Sunday at Comerica Park, the site of the defining moment of his 15-year career. 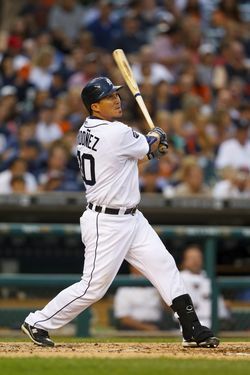 Ordonez, who hit a walk-off home run to end the 2006 ALCS and send the Tigers to the World Series, spent the last seven seasons of his career playing in Detroit. Ordonez suffered a fractured ankle during last year's ALCS, his second such injury in as many seasons. The 38-year-old expressed interest in playing in 2012 and the Athletics appeared to have some interest, but he never signed a deal. Ordonez retires with 294 home runs and a .309/.369/.502 batting line in 1848 games over the course of 15 seasons with the White Sox and Tigers. The six-time All-Star won the 2007 American League batting title and three Silver Slugger awards. Ordonez, a longtime Scott Boras client, earned more than $133MM in his career, according to Baseball-Reference. TUESDAY, 3:21pm: Ordonez told Ignacio Serrano from El Nacional in Venezuela that he hasn't retired just yet. "It's not official, I still haven't retired, but if in something doesn't appear in the next two weeks, I think that will be my final decision." In regard to accepting a minor league contract, Ordonez was clear: "With all respect to the players in the minor leagues, I've played for 15 years in the big leagues and I don't want to play there" (via MLBTR’s Nick Collias). MONDAY, 7:11pm: Ordonez confirmed via e-mail that he wrote the tweet, reports MLB.com's Jason Beck. 5:50pm: Magglio Ordonez may be close to ending his 15-year Major League career, tweeting a message of "Estoy muy serca de mi retiro!" (translated as "I am very close to my retirement") this afternoon. The Tigers have confirmed that the Twitter account indeed belongs to Ordonez, reports Chris Iott of MLive.com. Ordonez suffered a fractured ankle during the ALCS, his second such injury in as many seasons. He had been cleared to resume baseball activities and had expressed interest in playing in 2012 but only on a Major League contract. The Athletics showed some interest in Ordonez but instead signed another veteran bat in Manny Ramirez. Ordonez, who turned 38 in January, hit .255/.303/.331 (all career lows) in 357 plate appearances for Detroit last season. Veteran Mark Ellis is excited to be with a big market club such as the Dodgers and sounds excited about the team spending competitively in the future, writes John Shea of the San Francisco Chronicle. Ellis also wants to see his former club, the A’s, get the new stadium that they’re pushing for. Mike Bauman of MLB.com believes that the Rangers’ rotation will be just as solid as it was last year even following the departure of C.J. Wilson. It wouldn’t surprise MLB.com’s Bill Ladson if Nationals General Manager Mike Rizzo traded for a center fielder for the long term before the season started. Ladson also sees John Lannan being dealt before Opening Day. Orioles reliever Kevin Gregg would like to remain with Baltimore despite rumors of a possible trade, writes Brittany Ghiroli of MLB.com: “I wasn’t blind to the fact that this team was a work in progress, and that’s part of what drew me here. [I wanted] to be a part of it,” Gregg said. Gregg signed a two-year deal with the O’s prior to 2011 that includes a $6MM vesting option for 2013 based on appearances. Free agent outfielder/DH Magglio Ordonez would like to play in 2012 but isn’t close to signing and is currently in his native Venezuela, tweets Jon Paul Morosi of FOXSports.com. Maggs, 38, batted just .255/.303/.331 in 357 plate appearances last season, though he posted respectable offensive numbers as recently as 2010. The Mariners could boast a terrific rotation right now had they retained the likes of Cliff Lee, Brandon Morrow, Doug Fister and Michael Pineda, writes Ken Rosenthal of FOXSports.com, but GM Jack Zduriencik instead opted to trade off those arms in an attempt to replenish a thin farm system. Now, the M’s are pinning their hopes on young, cost-controlled hurlers Taijuan Walker, Danny Hultzen and James Paxton, as well as a few other prospects. Melvin Mora has received offers from the Athletics, Rangers, and Marlins, but he's told all three teams they'll have to wait on his decision, the 40-year-old told Nelson Suárez at the Caracas paper Correo del Orinoco. Right now, Mora is dedicating himself to overseeing the construction of a weather shelter for Caracas' thousands of motorcycle messengers. "They've offered me minor league contracts with the possibility of returning to the majors, which I'd be able to do, because I feel like I'm in shape," Mora said. "I've still got two years left in baseball, but for the moment this project is my priority." At the other end of the spectrum, Magglio Ordonez told Marcus Grunfeld at Beisbol Venezolano that he's still waiting for offers. "There's still nothing," he explained. "The games have barely begun, and the teams are still studying their needs. It's possible that I'll receive an invitation to some camp." Ordonez insists he won't discount any possibility, though he would prefer a starting role. The Blue Jays signed Dominican outfielder Andres DeAza, reports MLB.com's Gregor Chisholm. The 17-year-old was passed over in last year's July 2nd class. The Pirates signed three players from the Mexican League's Leones de Yucatán, according to the Mexican team's site. Infielder Julio Perez, 20, left-handed pitcher Omar Basulto, 19, and lefty Eduardo Vera, 17, will all report to the Pirate's Dominican complex before receiving minor league assignments stateside. Free agent outfielder Magglio Ordonez told Los Cronistas that he wants to play, but doesn't plan on accepting a minor league deal (Twitter links, hat tip to Danny Knobler). The Athletics and other clubs have shown some interest, but haven't made concrete offers. Jim Margalus of South Side Sox explains why the Kosuke Fukudome signing makes sense for the White Sox. They locked the outfielder up for $1MM yesterday. Cubs first base prospect Anthony Rizzo told Jim Memolo and Todd Hollandsworth on MLB Network Radio that being traded two offseasons ago helped prepare him for the recent deal that sent him from San Diego to Chicago. In a piece for FanGraphs, Mike Axisa takes a look at MLBTR's list of out of options players and breaks down some trade candidates, including Kila Ka'aihue and Sean West. Matt Eddy of Baseball America has the complete minor league transactions for February 8th-13th. On this day in 1988, the Padres traded Rich Gossage and Ray Hayward to the Cubs for Mike Brumley and Keith Moreland. Here's a look at today's links..
Joel Sherman of the New York Post writes that the Yankees and Red Sox are no longer alone as financial superpowers. Sherman also looks at five offseason market trends that will impact the 2012 season and beyond. In analyzing the Orioles' collection of non-roster invitees and the 40-man roster decisions they'll face this Spring, Roch Kubatko of MASNsports.com writes that Baltimore would eat a portion of Kevin Gregg's $5.8MM salary to trade him. Kubatko also speculates that an out of options player like Pedro Strop could be moved during Spring Training. Free agent Scott Kazmir is set to throw for scouts in Houston on Wednesday, tweets Buster Olney of ESPN.com. Jorge De La Rosa will undoubtedly exercise his $11MM player option for 2013 as he rehabs from elbow surgery, writes Troy Renck of The Denver Post. If he does that, the Rockies receive a $11MM club option for 2014. Red Sox officials seem to think they’ll know what they’ll be getting from the Cubs “before the official start of spring training,’’ but it's not clear if that refers to when pitchers and catchers report or when the full squad arrives, writes Nick Cafardo of the Boston Globe. If Magglio Ordoñez doesn't find a big-league job this season, he will have his own professional baseball club waiting for him in his native Venezuela, writes Robert Downs of the Detroit Free Press. The slugger is set purchase shares in the Caribes de Anzoátegui when he retires. The Indians and Casey Kotchman never talked about anything but a one-year deal, writes Paul Hoynes of The Plain Dealer. The first baseman signed with the Tribe for $3MM earlier this month. Beane said he's looking to sign a DH for the middle of the lineup, Joe Stiglich of the Bay Area News Group tweets. The GM added that it's not easy to find a cleanup hitter right now. A's scouts saw Ramirez work out recently and they're interested, ESPN.com's Buster Olney confirms (Twitter link). A final decision on whether to try to sign him is expected within the next week. The A's continue pursuing Manny Ramirez and they're much more interested in him than Magglio Ordonez. Ordonez's health is more of a concern, Slusser writes. Signing Ramirez would be the last thing the A's do before starting Spring Training, and a deal could be reached after camp opens. People in the A's organization are intrigued by Kila Ka'aihue's power and if the A's sign Ramirez, Ka'aihue would likely get the chance to DH while Ramirez sits out his 50-game suspension. The A's have some interest in free agent DH Hideki Matsui, but he's a "real long-shot," Slusser reports. They've had some talks about Johnny Damon, who might be out of the team's price range. The A's are considering Koji Uehara, Slusser confirms. ESPN.com’s Buster Olney says “nothing is close” regarding Uehara and that the Rangers are looking to obtain a good return in talks with Baltimore (Twitter link). Ken Rosenthal reported Oakland's interest over the weekend. In addition to Manny Ramirez, the A's are also evaluating Magglio Ordonez for a spring tryout, according to Peter Gammons of MLB.com (via Twitter). The slugger is recovering from surgery after re-fracturing his right ankle during the ALCS in 2011. Roughly two weeks ago, Jon Paul Morosi of FOX Sports reported that Ordonez could be medically cleared by this point which would in turn spark interest in him. Ordonez, who turned 38 last Saturday, hit just .255/.303/.331 in 92 games with the Tigers last season. On its face, it’s hard to argue with the Mariners bringing in Kevin Millwood to add pitching depth at a minimal cost, writes Dave Cameron of U.S.S. Mariner. Like with every other move the M's have made this off-season, Cameron writes, the veteran is a nice role player at a good price. The Rockies were willing to give Millwood a guaranteed deal during the winter meetings, tweets Troy Renck of The Denver Post. The market for Magglio Ordonez should pick up once he's medically cleared for full activity, tweets Jon Paul Morosi of FOX Sports. Morosi says that could happen in two weeks' time. David Eckstein, who decided to retire according to the Boston Globe, had a chance to play with the Mariners in 2011 but didn't take it, according to Jon Heyman of CBS Sports (Twitter link). John Romano of the Tampa Bay Times looks at the Rays' stadium situation in light of a recent meeting between owner Stuart Sternberg and Tampa Bay mayor Bill Foster. Romano writes that Sternberg wants to begin looking for new locations now, while Foster doesn't want the Rays to leave St. Petersburg on his watch. An extra wild card team is far from a sure thing for 2012, tweets ESPN's Jayson Stark, as "big scheduling obstacles remain" to be worked out before baseball can expand its playoffs for this fall. Tony La Russa has been "informally offered" Joe Torre's old job as MLB's executive vice president for baseball operations, reports USA Today's Bob Nightengale (via Twitter). La Russa has given no indication that he is interested in the job. Magglio Ordonez intends to play in 2012, Jon Paul Morosi of FOX Sports reports. The free agent outfielder is making progress in his recovery from right ankle surgery. Kerry Wood said on the Waddle & Silvy Show on ESPN 1000 that there's "nothing new" to report on his near-deal with the Cubs. Dan Johnson, the unlikely hero of the Rays’ exhilarating comeback in the final game of the regular season, tells Joe Christensen of the Minneapolis Star-Tribune that he’s still looking for a job. Dodgers scout Carl Loewnstine continues working as he battles bone cancer, Bob Nightengale of USA Today writes. Loewnstine will be honored this weekend at a banquet benefiting the Professional Baseball Scouts Foundation in California. Red Sox GM Ben Cherington and David Laurila of FanGraphs discussed the role of information in the decision making process of an MLB front office. The Red Sox don’t expect to offer guaranteed deals to free agent pitchers, Jon Heyman of CBSSports.com tweets. The asking price for Hiroki Kuroda and Roy Oswalt is dropping, but those pitchers aren’t likely to sign in Boston, Heyman writes.